There’s a new Steve Jobs book coming out later this month, written by Brent Schlender, a reporter who interviewed Jobs several times throughout his life, and Rick Tetzeli, editor at Fast Company. The book, Becoming Steve Jobs, isn’t set to be released until March 24, but Cult of Mac discovered some of the contents could be read using Amazon’s “Look Inside the Book” feature and shared a few interesting tidbits that we haven’t heard before. One of the best parts is a story about Steve Jobs and Tim Cook, which took place when Steve Jobs first got sick. When Jobs was ill and needed a new liver, Tim Cook offered to donate a portion of his own liver because the two shared a blood type. Jobs turned down Cook’s offer and later received a full liver transplant in 2009. After discovering that he shared a rare blood type with his sick colleague, and undergoing a battery of tests at a hospital “far from the Bay Area, since he didn’t want to be recognized,” Cook offered his liver to Jobs — only for Steve to turn it down. “Somebody that’s selfish doesn’t reply like that,” Cook says. The book also reveals that Steve Jobs and Disney CEO Bob Iger contemplated buying Yahoo! as a way for Apple to get into the search business, and it unveils some details that contrast information that Walter Isaacson shared in his Steve Jobs biography. Amazon has removed much of the content that was offered via “Look Inside the Book,” so additional stories about Jobs and other executives will be kept under wraps until its debut 12 days from now. 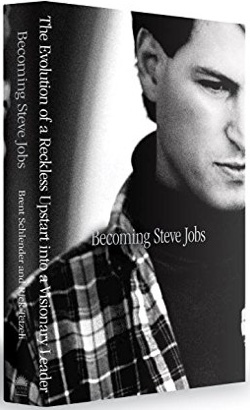 With the book, Tetzeli and Schlender have aimed to explore the story of how Steve Jobs made the transformation from an arrogant young man exiled from Apple to the visionary leader that skyrocketed Apple to fame. The two authors interviewed many of Jobs’ friends, family, and inner circle, getting access to never-before-told stories. Tim Cook, Jony Ive, Eddy Cue, Ed Catmull, John Lasseter, and Robert Iger all contributed to the book.